Get rid of that clunky folding chair! 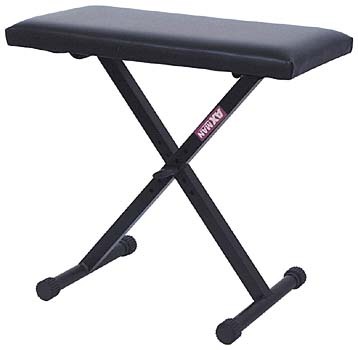 The Deluxe keyboard bench features 2-1/2" thick foam padding on its matte black, durable, grained-vinyl seat. Adjustable to five heights via a central leg-adjustment featuring a specially designed tightening device for stability and safety. Adjusts from 17" to 22-1/4" high. Seat measures 12" x 24" x 2-1/2". Matte black, durable, grained-vinyl seat. Adjustable to five heights via a central leg-adjustment featuring a specially designed tightening device for stability and safety. 12" x 24" x 2-1/2". from 17" to 22-1/4" high.